Buy New Condition Microwave Tea Dryer And Sterilizer /Microwave Oven - Shandong Leader Machinery Co.,ltd. Shandong Leader Machinery Co.,ltd. strives to meet all legal and ethical requirements, and, as soon as possible, we also strive to go beyond these requirements. Shandong Leader Machinery Co.,ltd. 's responsibility is to do business in accordance with the highest professional and ethical standards and practices: the company will not tolerate any noncompliance. Tea Dryer Sterilizer main application of materials for the tea. Tea is a dicot plant, in our country there are 14 genera and 397 species. Tea is young leaves of tea tree leaves, and we usually refer to the life of the leaves of tea tree after processing, available to drink water products. Organic chemical composition of tea up to 450 kinds of more than 40 kinds of inorganic mineral elements. When improper storage of tea will be tempered by the temperature, even moldy, at this time must not be used in the sun drying, sun-dried tea will become bitter and difficult to drink, so tea should be treated as soon as possible after damp. Shandong Leader Machinery Co.,ltd. Tea Dryer Sterilizer non-standard equipment, according to the specific production of customers, the type of tea, dry taste requirements, such as separate design and manufacturing. Shandong Leader Machinery Co.,ltd. New Condition Microwave Tea Dryer And Sterilizer Machine/microwave oven energy saving and environmental protection, stable operation, high thermal efficiency, can dry a variety of varieties of tea, the equipment sold overseas, get a lot of foreign praise. Success stories: export Sri Lanka drying black tea package equipment. Related products: microwave buckwheat tea drying equipment,microwave agricultural drying equipment. We believe that you purchase Shandong Leader Machinery Co.,ltd. 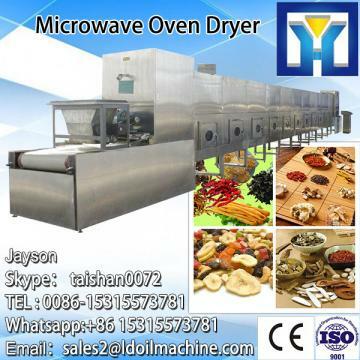 New Condition Microwave Tea Dryer And Sterilizer Machine/Microwave Oven is your best and sensible choice. microwave energy can directly penetrate through the tea so that can heat the internal and external at the same time, and do not need to preheat,when open the machine,the produce will start. But traditional sterilization machine, there must be a preheating process. When we film the tea using for microwave energy, surface temperature is not high,so that does not need cooling at the time of the leaf out. So the leaf changes little, and colour is still green hide, aroma loss.At the same time due to water evaporation speed, easy to form many little porous,so product has a good water complex. While filming for the traditional tube, high temperature and heterogeneous, the operator is difficult to grasp, easy to produce coke and unstable. This equipment adopts automatic upper and lower expected, the operator simply press a button and monitor operation of the equipment,so the whole production only use 1 to 2 people. microwave drying have the functions of sterilization, alcoholization, and the equipment does not produce smoke ,noise and high temperature environment. It is the ideal pollution-free, environmental protection equipment in the tea industry. at the same time, the formation of make tea better. For the whole New Condition Microwave Tea Dryer And Sterilizer Machine/Microwave Oven,warranty is 12 months,within 12 months,if have equipment quality problems,we will provide accessories freely. After the expiration of the warranty period,if have spare parts problem,we only receive the cost of required replacement parts.We commit we will provide free technical support of equipment all whole life. Our company has engaged in producing and exporting New Condition Microwave Tea Dryer And Sterilizer Machine/Microwave Oven for many years, and until now, our machine has exported to overseas market, such as Brazil, India, Indonesia,Russia, Thailand and so on, and get the foreign customers' unanimous praise.